Chuck Johnson’s impact on the contemporary guitar world continues to be felt. His first two solo records signaled the arrival of a unique player, steeped in various forms of playing and influence, yet distinctly modern. Johnson eschews a weathered traditionalism for the wide-scope expanse of 21st Century Americana. On his third album, Blood Moon Boulder, Johnson reaches a compositional peak in a nod to the picturesque naturalism of the American landscape. The dynamics of his range can be felt on this singular record, a soundtrack-like listen that rewards the ear with rich detail. His precision and tone recall the heights of Ry Cooder’s Paris, Texas on the extended opening track “Corvid Tactics.” Notably, the guitarist duels with a phantom Chinese radio signal that slips through the silences during the recording session. One can hear the ghostly sounds peek through at moments as Johnson bends his strings. 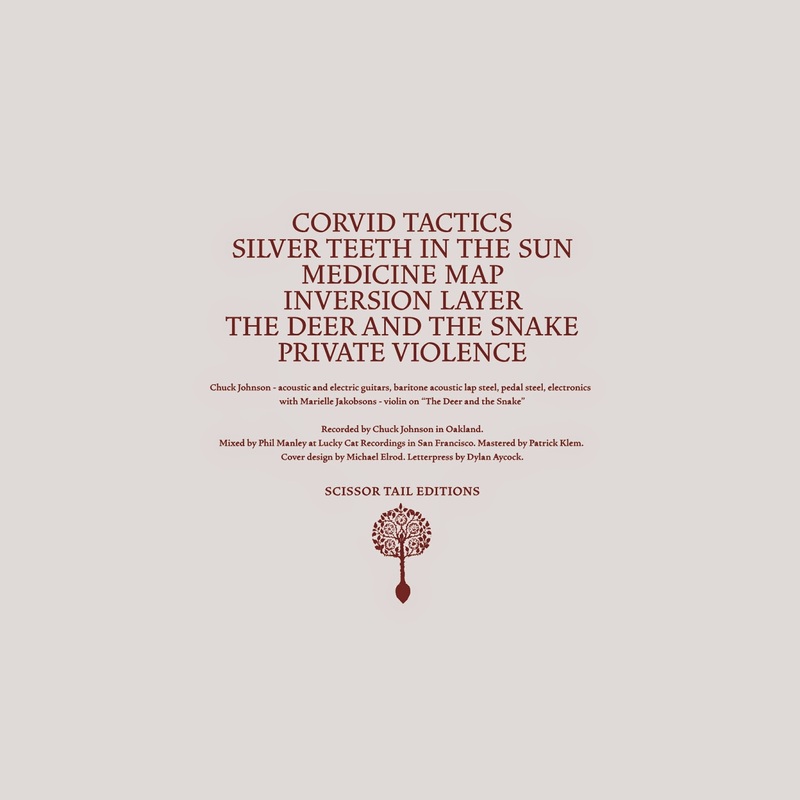 “Medicine Map” delivers a melodic melancholy, with an every-note-perfectly-placed aesthetic. Rather than ramble or evoke some kind of outdated nostalgia, Johnson lets his cinematic instincts take lead. 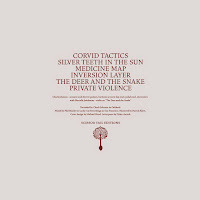 Perhaps most evocative of this approach is “Private Violence,” a meditative composition with gorgeous pedal steel played on top of electric six-string, ending in a sustained tonal minimalism that could easily stretch into a whole LP of its own. Blood Moon Boulder contains a lyricism, an exactitude and emotional arc all its own. And that’s worth playing again and again. 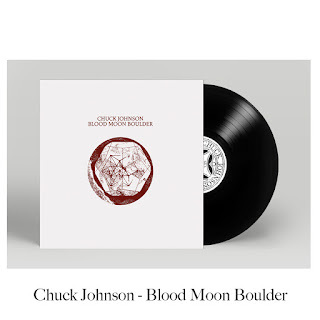 "With a couple decades of avant-rock and electronic composition under his fingers, Chuck Johnson is at his most conversational in Blood Moon Boulder. His third album of solo acoustic guitar music can be steady and beautiful, then answer with a soul-stirring quake. The North Carolina-reared, Oakland-based musician tells NPR, "The tunes on the new LP have the inevitable influence of the geography of Northern California. But at the same time, you can take the boy out of the South…"
"...Johnson has spent a lot of time doing different things quite well; on Blood Moon Boulder, he displays equal facility at putting them together. " Dusted Magazine -Bill Meyer.